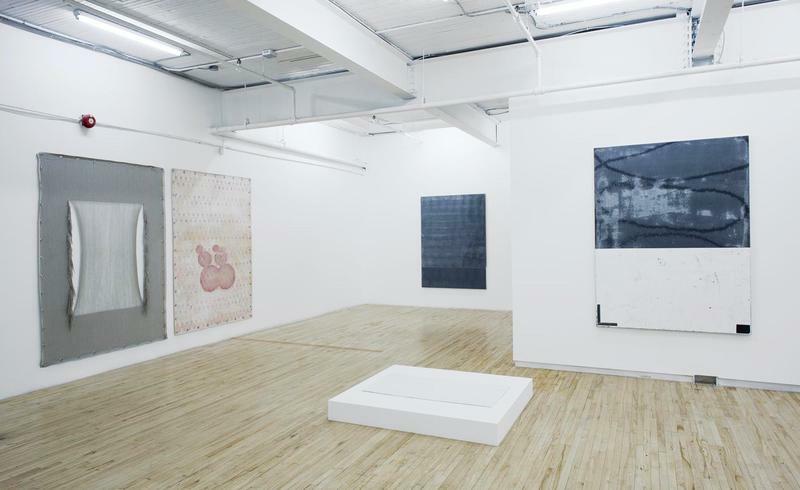 The image in question (installation view, 2013) Left to right: Beth Stuart: work, (Jack Bush), 2012, commercial painter's linen, weft artially removed and warp spranged, gesso, acrylic paint, gmmets, hanging hardware 211 x 152 cm; Beth Stuart: work, (Varvara Stepanova), 2012, acrylic and water media on canvas, grommets, hanging hardware 211 x 152cm; Jean-François Lauda: Untitled, 2012, pigment and acrylic on canvas, 183 x 132 cm; Chloé Desjardins: Ailleurs, 2012, plaster, 2 x 60 x 90 cm, edition 1/3; Jean-François Lauda: Untitled, 2012, pigment and acrylic on canvas, 183 x 132 cm. 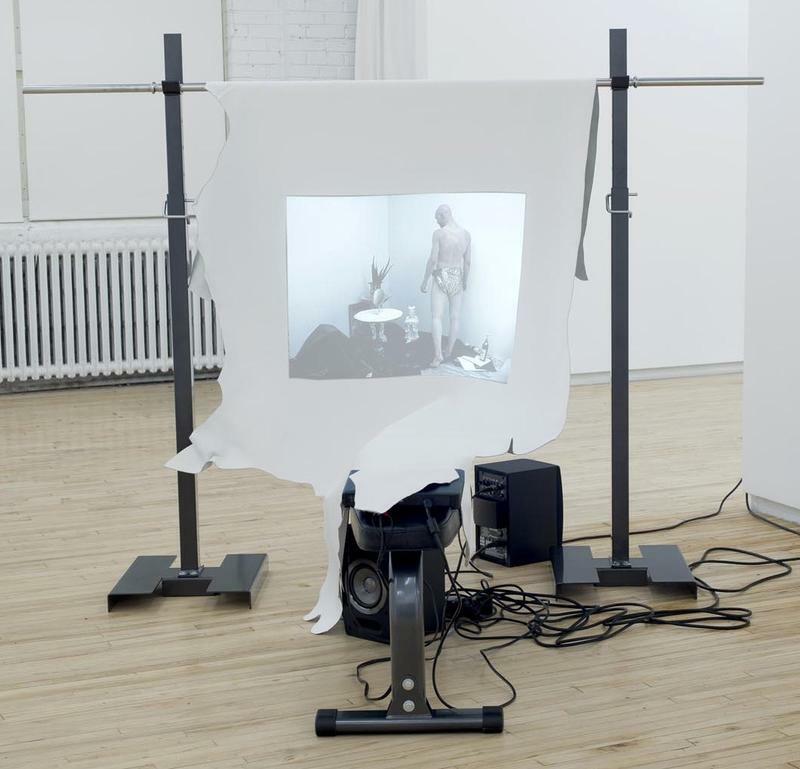 Images courtesy Battat Contemporary, Montreal. Photos: Éliane Excoffier. The seemingly incommensurable vocabularies of featured artists Chloé Desjardins, Jean-François Lauda, Julie Favreau and Beth Stuart made for a nicely dovetailed exhibition. Part of the “Extreme Painting” series launched by the Contemporary Art Galleries Association in Montreal, it demonstrates considerable curatorial élan and interrogative savvy in exploring what is still possible for that canvas-bound art called painting, even when the canvas has been left behind. But, while seeming to lack any common quality on which to compare them, notably all the artists here think chameleon. In her sculpture, Chloé Desjardins’ changelings vex us as gnomic simulations of a Real that they have long since left behind. In Presence (2012), polystyrene foam, wax and paint are stand-ins for a sculpture or mineral specimen on an integral plinth. In Ailleurs (2012), plaster perfectly simulates a brilliantly worked bath mat – or is it a painting on the floor plane? These 3-d objects are swapped Modernist children – but their subversiveness and charm lie in the fact that they are repletely unbaptized changelings. Julie Favreau: Le froid, le marbre/The cold, the marble (2010/2013). Bench press, cow leather, video, DV-NTSC, 4 min. 39 sec. Videography credits: performer: Laël Stellick, music: Jean-Pierre Gauthier et Mirko Sabatini (Duo Travagliando)Over the last few years, Jean-François Lauda has pursued an experimental abstraction that has set him apart from many of his contemporaries in Montreal and elsewhere. It is tempting to position him in the context of critical late-Modernism. But, as the three recent paintings exhibited here show, he is also chameleon – and, well, chimera (I mean the latter in both mythological and genetic terms). He has two distinct sets of painting cells that exist side-by-side. One issues from the ambition of late Modernist abstraction and the other from its heroic opposite: the desire to subvert a painted surface and make it anew as something altogether fey and unforeseen: a palpably mutative event. His paintings are feral, bluntly literal and, well, graphically sensuous in their attention to the materiality of pigment and support. But then, they are saturated with feelings that reach into and beyond the material. Julie Favreau’s remarkable video The Cold, The Marble (2010-2013) calls painting into question even as it enables the cinematic. This work, a hectic and compelling collision of Nicolas Roeg’s The Man Who Fell to Earth (1976) and Maya Deren’s Meshes of the Afternoon (1943), offers an altogether gnomic scenotomy in which an actor interacts with various objects as though newly arrived from another star system. Both specular and exceedingly strange, this work easily embeds the viewer in its mise-en-abyme. It also has haunting overtones of Robert Heinlein’s Stranger in a Strange Land (1961), the seminal sci-fi masterpiece about Valentine Michael Smith, a human who comes to Earth in early adulthood (after being born on the planet Mars and raised by the Martians) who must then confront the wholly human. Beth Stuart’s arresting objects are profoundly somatic and postural in both materiality and mien. Her work, (Jack Bush) and work, (Varvara Stepanova) (both 2012), whose titles reference the Canadian and Russian painters respectively, are poised in lively, libidinal dialogue. The spranged leather in stanchions for E.H. (Thingdu), also 2012, reminds us how innovative Stuart is while following an ancient Danish weaving technique called Sprang. As she has done in earlier shows in Montreal and Toronto, Stuart performs an exacting triage on both painting and sculpture here, and her hybrids undermine the old Modernist orthodoxies with humour and panache. Beyond the body-image, they also possess something purely liminal – a sort of ontological life-by-proxy. Here, too, is the work of a very gifted chameleon.